Last weekend my daughter Laura and her two children came to visit from Manchester and, keen to be the pampering granddad, I collected them in the Mercedes-Benz CLA Shooting Brake which I was testing. Being a rather old-fashioned type, I remember the term shooting-brake as applying to a rather large estate which had evolved down from the vehicle built "to take gentlemen on the hunt with their firearms and dogs". Rolls-Royce were particularly good at building them. However, the modern shooting-brake is an altogether different vehicle. While manufacturers fall over themselves not to call estates what they are, often preferring words like Sportwagon, Touring, Avant or Combi, the term shooting-brake seems to reserved for station-wagons that are more coupe-like, even sometimes with only two doors. They tend to be more fashion statement than practicality, and this was especially so with the CLA Shooting Brake whose rear loading area was compromised by an opening restricted by the large rear-light clusters. But the carrying capacity is bigger than the coupe - if not by much until you fold the rear seats. "Gentlemen and their firearms" would find the whole thing a squeeze but Ben, Amy and Sam the dog found it ideal. At the other end of the scale, if you want a lot more carrying capacity, the new Mercedes-Benz V Class was launched over here on the same day as the CLA Shooting Brake. It will take eight adults and a decent amount of cargo. Colleagues warned me that I probably wouldn't like the CLA SB as the 2.1-litre diesel with automatic box was under-powered and didn't have the performance to match its very fine lines. This was true but when you got it up to the speed limit on the motorways, it was totally relaxed motoring, beautifully insulated quiet confidence. The well-insulated cabin, high levels of safety equipment and the very good looks are the best thing about the CLA SB. The highly-equipped test model - with extras of reversing camera (much needed as visibility out of the back is poor), ambient lighting, panoramic sunroof, metallic finish and a 'Light and Sight Pack' - came in at €47,798. There are a lot of variants coming including a very fast AMG version. The CLA models are definitely part of Mercedes' onslaught in getting a younger, trendier customer. That obviously isn't me. I found the ride too firm, the steering lifeless and overall visibility poor. Yet I can see that, for many, the car would be an attractive piece of kit. It is also cheap to fuel and tax. The brochure for the CLA Shooting Brake does hark back a bit to the old meaning of the term. I'll give you a flavour of it. Claiming that it is "designed for urban hunting... life in the city is an adventure, new districts are springing up overnight... a new hunting ground, ready to be conquered. 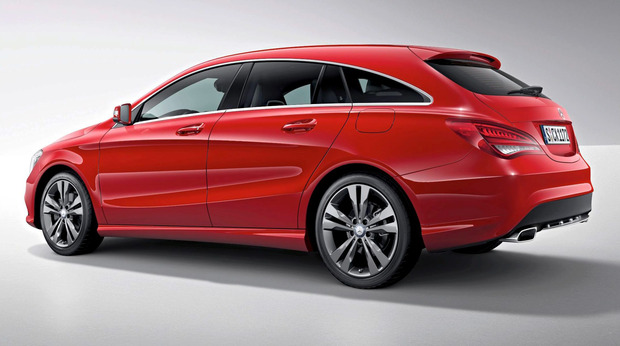 The new CLA Shooting Brake senses the challenge, hungry and unfettered, as if made to hunt for the best." Right, then. I think I'd prefer to go off with the "gentlemen, firearms and their dogs". l Incidentally a Rolls-Royce Silver Ghost, which was bought by the then British Prince of Wales in 1922 to go on shooting parties at the Royals' Scottish retreat, is tipped to fetch around €160,000 at auction later this month. It is rumoured that the prince, who caused a constitutional crisis in 1936 when he abdicated as King Edward VIII, had special blinds fitted to the car so he could meet his lover, the American divorcee Wallis Simpson, without being seen.